Celena's Bakery is renowned for its croissants, and after taking my first bite, I can confirm that the real thing lives up to the lore. 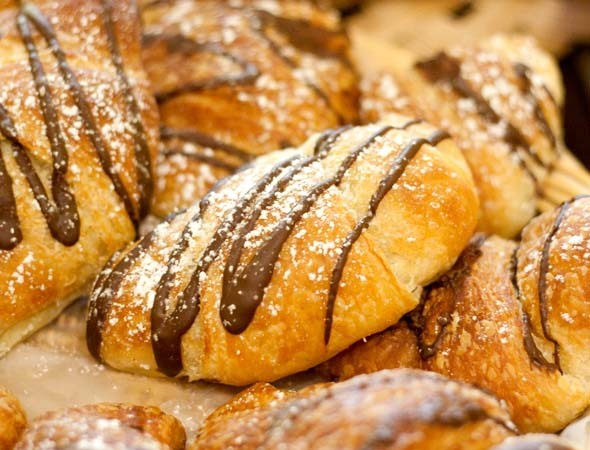 Crispy and buttery with a sweet chocolate centre, Celena's chocolate croissants ($2.25) are a neighborhood favourite. 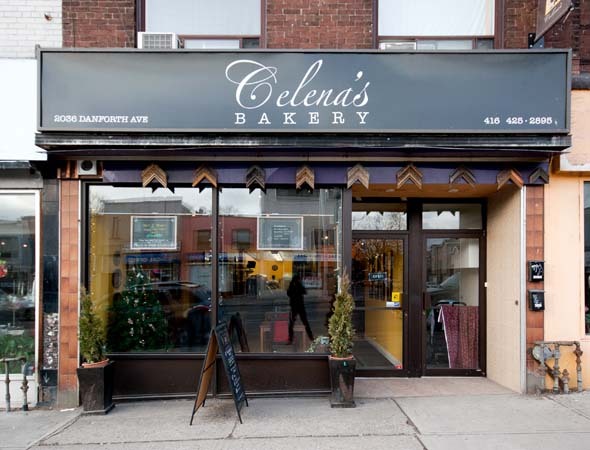 About a block west of Woodbine on Danforth Ave., the decadent treat and its simpler sister puff pastry, Celena's plain croissant ($1.50), tend to sell out fast. 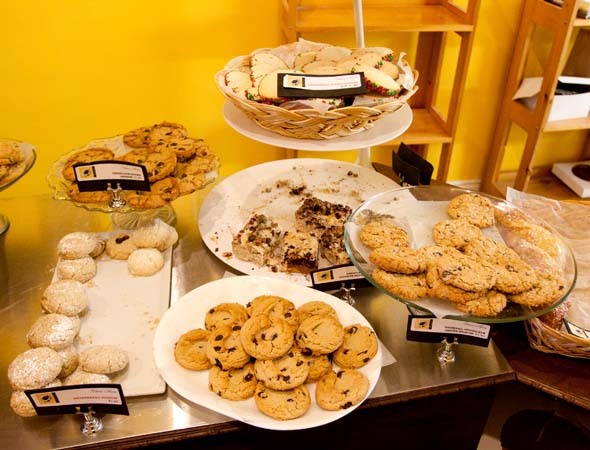 They've got some substance to them, so don't be fooled by the size, and are always baked fresh in Celena's open kitchen. In fact everything at Celena's, right down to the preserves used in their danishes ($1.75), is made onsite. 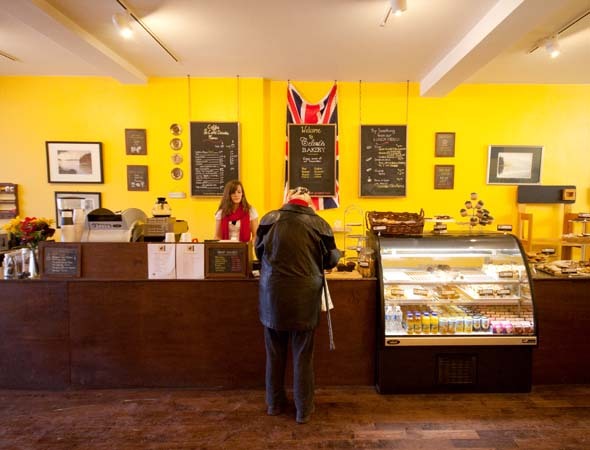 The bakery is a new fixture on this changing stretch of the Danforth, opened just 10 months ago. The Mom & Pop business is run by husband-and-wife-team, Celena and Richard Cambrige, who look more like Mom & Pop's grandchildren than Mom & Pop themselves. (I'll admit; I mistook them for teenagers working the cash.) 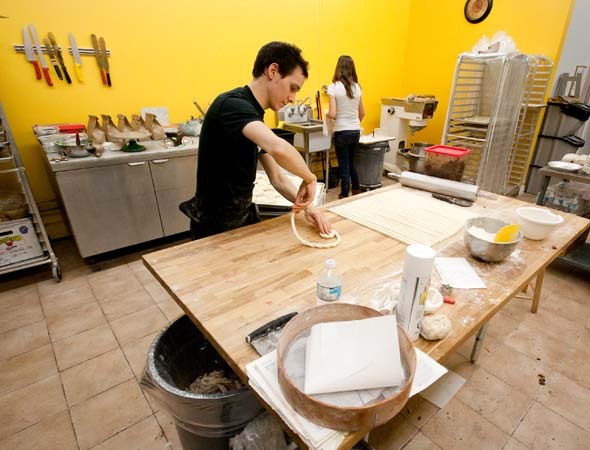 The pair met at George Brown and went after Celena's dream of starting her own bakery after graduation. 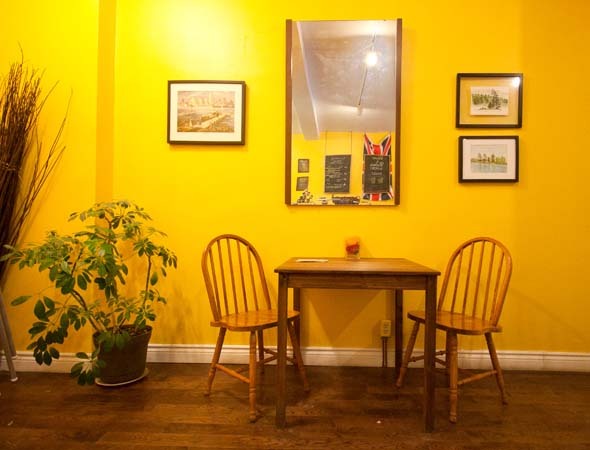 Since then, their mustard-yellow painted bakery has attracted an eclectic mix of neighborhood residents and visiting nine to five'ers. Lunch favourites include Celena's mini quiches, such as the caramelized onion and spinach quiche ($2.50), or one of the bakery's own fresh pizzas, such as the tomato and bocconcini on sourdough pizza ($4.50). 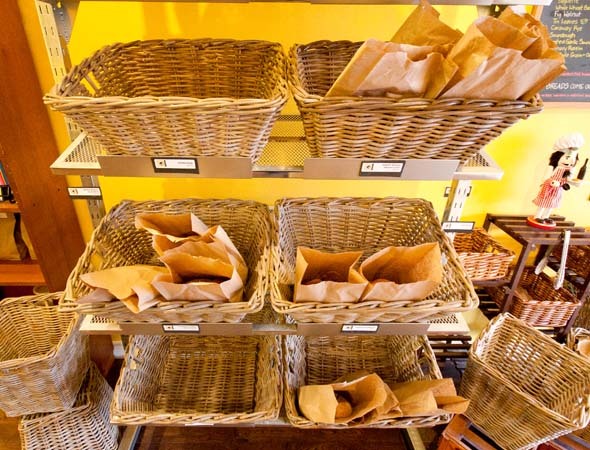 Locals pop by early for a loaf of Celena's signature breads; the very popular roasted garlic sourdough ($4.50) or English-inspired rosemary raisin loaf ($4.50). Richard says a lot of their recipes are bred from his and Celena's English and French heritage, unique to the area that was once largely Italian. The demographics of the neighborhood seem to be in flux, a change that will likely be accelerated as a new condo on Danforth rises up just a block away. The bakery remains quiet, though, as I munch on my croissant, as a few afternoon commuters stop in for a cheese scone ($2.50) or oatmeal chocolate chunk cookie ($1.25). Celena says they're usually brimming in the mornings with new moms, artists, and people working from home, followed later by the lunch rush, with activity tapering off in the early evening when a lot of their stock has sold out. It seems I nabbed that chocolate croissant just in time.